Sunday Telegraph columnist Mary Killen has written an insightful piece on how you can deal with mobile smartphones. And if there’s one thing that’s especially important for anyone public speaking, then that has to be dealing with interruptions. Now you might disagree with her running order, but you’d be hard pushed for a finer list. However, the challenge for public speakers is that it’s not just a ringing phone that you might have to deal with. That’s because you also have to contend with an audience that might well be distracted. Because they might be distracted enough to check their messaging or their emails. or, distracted enough to be twittering, perhaps! And that’s fine. It happens. Audiences are distracted. So, that means it’s your job to focus their attention on you, your subject and your line of argument. But what should you do if a phone does go off? What to do if someone else starts having a conversation during your speech? That’s an entirely different matter. Have someone say something before you start. So, ask your introducer to make a note about switching phones off, or to silent mode at the very least. Most audiences expect this nowadays. Pause. If a phone should go off during your speech, then aim to pause while the recipient of the call silences their device. Pause a little longer. Should the recipient of a phone call start talking to their caller then pause a while longer. In this way the silence and the attention of the whole audience will get them to cease their call or retire gracefully outside. Smile. Remember to smile, it’s not the end of the world. So long as you remain graceful about the whole business then your audience will stick with you. Try some humour. If a phone goes off, you could always try a quick line like…”I think that’s for me.” As a result, you’ll get a chuckle and the recipient of the call will probably look bashful and switch their phone off. You can expect your speeches will be interrupted at some stage. So, here are 5 tips to help you in dealing with interruptions. Have someone say something about phones before the start. Pause if a phone rings. Then give the person some time to switch off their phone. Pause somewhat longer if the person tries to take their call during your speech. Smile, and remember to be graceful. Because it’s not the worst thing in the world. Whatever happens don’t be riled by the incursion of the modern age. That’s because common sense and good grace typically get everyone through a range of public speaking interruptions. 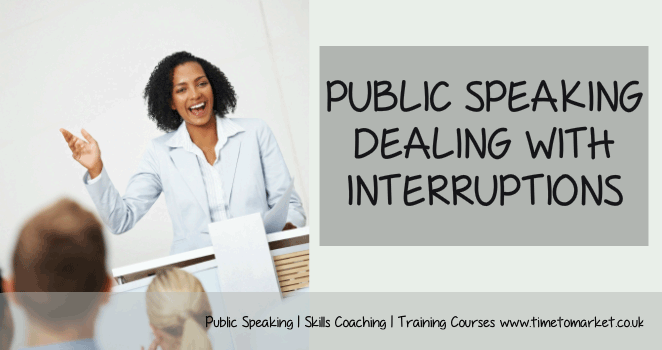 For more skills tips on public speaking and dealing with interruptions, you can always attend a public speaking training course. You can email us training@timetomarket.co.uk or phone to discuss. So, please don’t hesitate to get in touch.